Hope everyone is enjoying their summer. 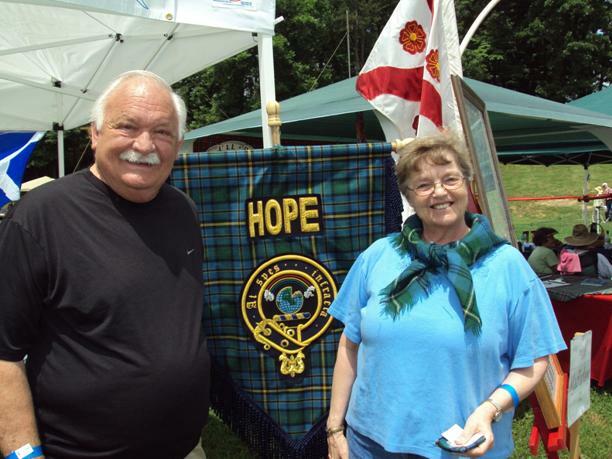 Last weekend the June weather was fabulous for the Blairsville Scottish Festival. This was our second year in attendance and as you can see by the pictures from this year out tent display has matured with time. This is one of the friendliest games I have ever attended. 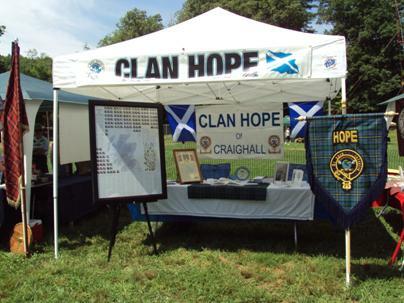 I was kept busy by the numerous folks from other clans inquiring about Clan Hope and our history. Sue Johnstone Joiner and her husband Pete came by the tent. Sue is actually a Hope Johnstone. I asked her to sit down with me and share her history with us. It is always fun to learn how others got interested in their family's genealogy and history. Sue got started when some of her relatives told her about her great great grandparents that had lived several miles south of Edinburgh. It was around 1980 when she took a trip across the pond to Penicuik, Scotland and was able to step inside the actual house in which her great great grandparents had lived and visited their gravesite. She was hooked! Sue is happy to share some of her Hope Johnstone ancestors with us. it looked a lot like	Scotland. Just a note that Sue is now a member of Clan Hope and we are grateful for her membership! Sue Johnstone Joiner and husband Pete are new members! Sue and Pete live very interesting lives. They have a home near Franklin N.C., a home in Florida and a caravan in Lochranza, Scotland on the Isle of Arran. No wonder they travel with the seasons! Sue explained how they love to watch the hills of Lochranza ablaze with yellow flowers in early spring, only to give way to the purple heather later in the season. I could not help but noticed how her eyes sparkled and grew brighter as she talked of the Isle of Arran and her treasured friends that live there. Thanks for sharing your story with us and we are glad you are our newest member and friend. At the Blairsville Games, I was lucky enough to meet and chat with Clan Nan Con. Translated; it means 'Clan of the Dog'. 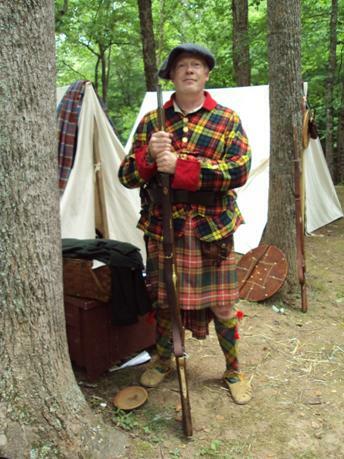 This clan is a historically accurate representation of the Highland Independent Company of Darien, Ga. This small army of Scottish soldiers was brought to Georgia by Governor James Oglethorpe in 1736. They were composed of an infantry, mounted rangers and sea rangers. Fighting included the Florida campaign of 1740, defending Fort Frederica, Battle of Bloody Marsh and Gully Hole Creek among others... Their purpose was to protect the Georgia coastline and they were active for ten years, beginning in 1736 until 1746. This group of dedicated people contributes a true sense of Scottish history and contribution to the founding of America. If you get a chance, stroll through their meticulous and historically correct military encampment. Their knowledge of events, equipment, culture and sacrifice will amaze you. They attend several games throughout the southeast and would be happy to talk to you. Thanks for the opportunity to represent Clan Hope of Craighall. As Southeast Commissioner I look forward to setting up our clan tent at the various games in our part of the nation. We are a small clan and I find ours to be closer knit than most others. There is such an importance to anyone that walks up to our clan tent and announces they are of Hope descent. This is twofold. First we earnestly wish to get to know you and your family history and of course share in all things Hope. Second, our clan is small and we rely on the membership dues to continue to meet the ongoing expense it takes to operate Clan Hope of Craighall. Membership dues financially enable us to attend games, place ads, and maintain our website, which by the way is a great way to share information and friendships. So I thank those that have an active membership wholeheartedly. If you have let your membership expire please take the time to renew it. We appreciate it and will put those funds to work wisely. Here is a wish list of things we are considering for 2010. Please let me know if you would like to attend or help out in any way.